All collector's edition pre-orders will receive the Theatre of War mini-campaign, along with some other goodies depending on where you buy it from. 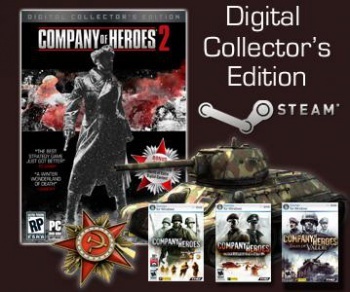 Company of Heroes was a critically acclaimed RTS from Relic games, set in World War 2 and utilizing a unique squad-based area-control mechanic that set it apart from other RTSs. The sequel is coming in June of this year, and if the promise of more Soviet vs German action isn't enough to entice you, Relic has detailed the pre-order bonuses for all versions of the game. The three tiers of Steam pre-order rewards seems to suggest that there will be a similar promotion to the recent BioShock Infinite pre-order campaign, which featured increasing tiers of rewards based on how many pre-orders it received. Steam currently has the release date listed as June 26.